“Covenants of Promise” from Christian Faith Publishing author Cameron Lewis reveals the God surrounding all through His covenants of promises. 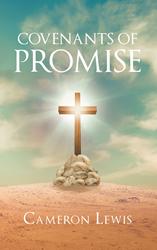 “Covenants of Promise” reveals the invisible touch of God in the daily lives of Christians. “Covenants of Promise”: a study on covenants and the God surrounding all aspects of life. “Covenants of Promise” is the creation of published author, Cameron Lewis, just an average Christian with the desire to know his God. That is what drove him to writing. Published by Christian Faith Publishing, Cameron Lewis’s new book teaches readers about the God surrounding them. According to the Strong’s Exhaustive Concordance, the Hebrew word “ber-eeth” translates into “covenant,” which is a league or compact made by a passing between pieces of flesh. A covenant is, therefore, a league between two or more parties declaring covenants of promises, which dictate what is to be done and what is not allowed to be done. “Covenants of Promise” studies the notion of covenants. It discusses topics such as laws and prophecies as well as priesthood and redemption. It is a study of how God’s promises define the Christian life. View a synopsis of “Covenants of Promise” on YouTube. Consumers can purchase “Covenants of Promise” at traditional brick & mortar bookstores, or online at Amazon.com, Apple iTunes store, Kobo or Barnes and Noble. For additional information or inquiries about “Covenants of Promise,” contact the Christian Faith Publishing media department at 866-554-0919.